Brandon and Alyssa get married! Home / All / Brandon and Alyssa get married! Straughan Photography had the pleasure of shooting the wedding of Brandon and Alyssa’s on Saturday, July 23, 2011. 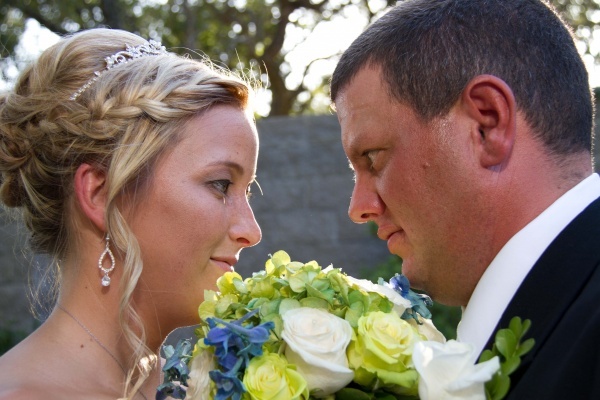 Their wedding and reception took place at beautiful Castle Avalon, in New Braunfels, TX. The bride chose lime green and pool blue for her colors, creating a very festive atmosphere. Immediately following the very loving ceremony everyone convened in the grand ballroom. Susan Charet was the coordinator for the event and everything ran smooth and on time. The ballroom was decorated festively in with table linens with green and blue sashes. Each table had a martini centerpiece that had either white, green or blue glowing diamonds. The centerpiece of the room was the amazing candy bar. There are all sorts of delicious candies and there seemed to be an endless supply! The wedding cake was the talk of the wedding,It was bright green with blue scroll work. On top there was a froggy bride and groom. Brandon’s house cake was cute and built just to specs. They are from Midland so most of their family and friends partied hard into the night. There was even an after party in one of the travel trailers that was in the parking lot! At the end of the evening the couple changes into their beach clothes left to a cascade of bubbles and a long line of friends. You can tell that Alyssa and Brandon threw a great party! Congratulations to both Alyssa and Brandon their wedding!